Definition at line 296 of file control-command.hpp. Definition at line 340 of file control-command.cpp. 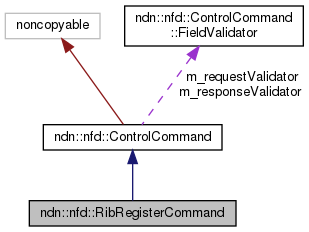 References ndn::nfd::CONTROL_PARAMETER_COST, ndn::nfd::CONTROL_PARAMETER_EXPIRATION_PERIOD, ndn::nfd::CONTROL_PARAMETER_FACE_ID, ndn::nfd::CONTROL_PARAMETER_FLAGS, ndn::nfd::CONTROL_PARAMETER_NAME, ndn::nfd::CONTROL_PARAMETER_ORIGIN, ndn::nfd::ControlCommand::m_requestValidator, ndn::nfd::ControlCommand::m_responseValidator, ndn::nfd::ControlCommand::FieldValidator::optional(), and ndn::nfd::ControlCommand::FieldValidator::required(). Definition at line 360 of file control-command.cpp. 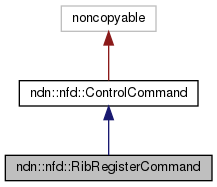 References ndn::nfd::ControlParameters::hasCost(), ndn::nfd::ControlParameters::hasFaceId(), ndn::nfd::ControlParameters::hasFlags(), ndn::nfd::ControlParameters::hasOrigin(), ndn::nfd::ROUTE_FLAG_CHILD_INHERIT, ndn::nfd::ROUTE_ORIGIN_APP, ndn::nfd::ControlParameters::setCost(), ndn::nfd::ControlParameters::setFaceId(), ndn::nfd::ControlParameters::setFlags(), and ndn::nfd::ControlParameters::setOrigin(). Definition at line 377 of file control-command.cpp.